I’ve admired the artistry of Ute Lemper for more than three decades, but always from afar. Last night I got to hear her live for the first time. Her performance at Texas Tech’s Hemmle Recital Hall was underwritten by the Texas Tech Center for Global Communication; it was open to the public at no charge. 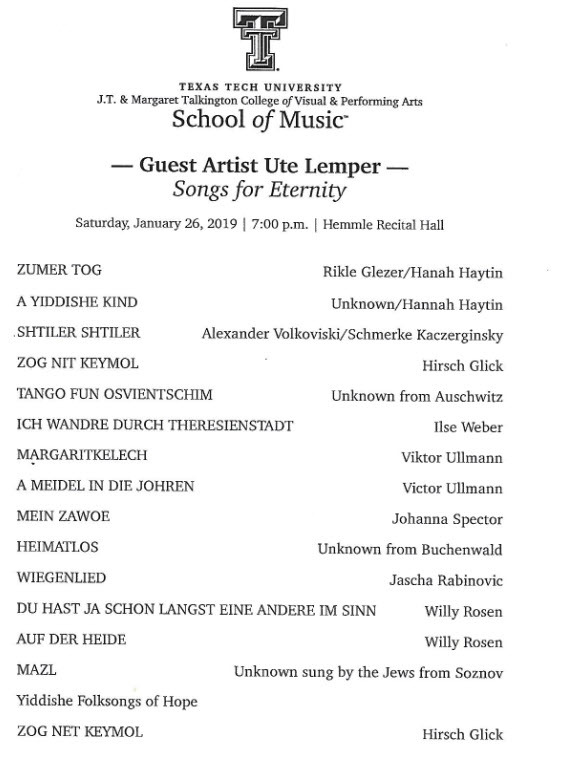 Songs for Eternity is a program compiled by Ms Lemper from music written by victims of the Holocaust or in response to it. Her 90 minute program – accompanied by piano, clarinet, and bass – was hard to take not because of the talent and effort that went into it, but because of its subject matter. The horror that inspired the music is still overwhelming. It was brought to Lubbock to commemorate International Holocaust Remembrance Day – January 27 – which this year marks the 75th anniversary of the liberation of Auschwitz. Lubbock is so remote from Ms Lemper’s usual venues, that she began her show by admitting that she had never heard of the place, though, of course, she knew the Hanseatic city of Lübeck. Her program absent a Billie Holiday song about lynchings in the American south (“Strange Fruit”) is at the end of this review. Though Ms Lemper is a very versatile artist who has performed in movies, on Broadway, and in London’s West End she is best described as a chanteuse in the style of Edith Piaf and Marlene Dietrich – though she has far more voice than either of them. She is particularly well known for her interpretations of the songs of Kurt Weill. In this niche she has no peer. Ms Lemper gave a description and the English words to the songs she sang. They were in either Yiddish or German though she did not specify which language the language she was about to use. The only exception was the Billie Holiday song which was in English. Ironically, though Lemper’s English diction is better than mine, it was the hardest to follow especially since she did not recite it lyrics before she sang the song. All the songs were performed with exceptional skill and feeling. The same was true of the brief solos by her three instrumentalists. The audience reacted with great enthusiasm to what is not the usual content of a concert in west Texas. Lemper’s voice is still a supple instrument despite more than 30 years of regular use in a demanding repertoire. It has deepened and darkened somewhat from her first appearances when she was in her early 20s; she now 54. But it is still unique. The song below is from an Italian performance of the same program that she gave last night. The hoarseness in her voice on the video was obviously a temporary indisposition as it was not heard in Hemmle Hall. Here is Ms Lemper singing one of Kurt Weill’s Broadway tunes: Speak low from One Touch of Venus. The lyrics are by Ogden Nash. Mary Martin introduced the song in 1943. In summary a skilled and moving performance by a major artist.